Indexes retreated, giving back all of the gains they racked up in yesterday's Federal Reserve-fueled rally. 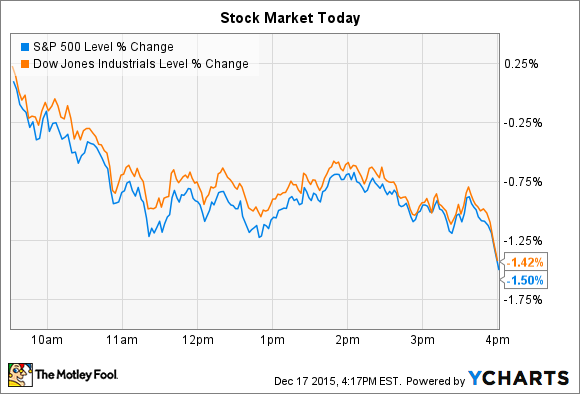 Stocks fell today, giving back all of the Fed-fueled gains they enjoyed yesterday. The Dow Jones Industrial Average (DJINDICES:^DJI) lost 253 points, or 1.4% and the S&P 500 (SNPINDEX:^GSPC) fell by 31 points, or 1.5%. That slide was enough to send the S&P 500 back into negative territory for the year – its seventh such move in 2015. Meanwhile, individual stocks posting large swings included streaming audio giant Pandora (NYSE:P) and home furnishings and decor retailer Pier 1 Imports (NYSE:PIR). Internet radio specialist Pandora saw its stock jump 14% today on five times its normal daily trading volume. The catalyst was important news about the royalties that Pandora is required to pay for most of the songs it makes available through its service. A ruling by the Copyright Royalty Board (CRB) just laid down new rates for these royalties, effectively raising them by 15%. And while a double-digit hike in content costs might sound like bad news, things could have been a lot worse for Pandora. SoundExchange, the royalty collector, had been arguing for an increase of roughly double the figure that the CRB ultimately decided on. "This is a balanced rate that we can work with and grow from," Pandora CEO Brian McAndrews said in a press release. In fact, the ruling removes a cloud that had been hanging over the company for some time – the risk that content costs might spike so high as to make the business unprofitable. "There can be no assurances that the [CRB] proceedings will not result in significantly higher royalties than we currently pay," executives prominently warned in the company's 2014 annual report . This development resolves that uncertainty, freeing Pandora up to keep investing heavily in expanding its reach to more listeners. Pier 1 Imports' stock sank 20% lower today, continuing a trend that's sent it down by 70% so far in 2015. The home furnishings retailer announced surprisingly weak third-quarter results while lowering its outlook for the full year. For the three-month period ended Nov. 28, Pier 1's comparable store sales ticked down 1%, which CEO Alex Smith attributed to "soft store traffic." This drop came despite price cuts that pushed profitability lower. Gross margin sank to 38% of sales from 42% a year ago . Pier 1 managed a few operating and financial wins this quarter. E-commerce sales were strong, growing to 17% of the revenue base – up from 10% last year. Inventories also fell, which suggests the company isn't sitting on piles of unwanted merchandise. And cost cuts kept earnings right in line with management's expectations. Still, slipping store traffic trends isn't good news for any retailer as we head into the holiday shopping season. And that's why Pier 1 had to lower its forecast for the full year. Comps are now expected to be flat, compared to the prior outlook of slightly positive. But the year ahead looks worse. Executives forecast comps declines of between 2% and 4% for 2016, and that number includes projected growth from e-commerce sales. "The casual in-store shopper continues to challenge us," Smith said. "We are revising our full-year outlook based on a moderate start to the holiday shopping season and an increasingly competitive promotional environment."